It's the ultimate dream of most Sweet Adelines -- That moment in their lives when they are declared the best in the world. Those who reach for the stars can hardly picture the moment without imagining the emotion of having a shining, glistening crown placed upon their heads. The crown. It has been the symbol of our quartet champions throughout our history. But just when and how did it become the tradition we know today? The first four championship quartets received not much more than a title. The Decaturettes (1947) were called "World's Champion Women's Barber Shop Quartet." There were no crowns pins or certificates. The Johnson Sisters were presented with a silver pin and named 1948 Queens of Harmony, probably inspired by the Miss America Pageant and a popular television show, Queen for a Day (1941-1964). Since the title certainly seemed to stick, it was only a matter of time before the royal symbol followed. "The Quarternotes received the first crowns from the hostess chapter in Santa Monica, California in 1951," says Nancy Bergman, tenor of the 1954 champions, Mississippi Misses. "They were fresh flower garlands, and of course did not last, but the IDEA did!" The following year in St. Petersburg, FL the Pitch Pipers, who won the Queens of Harmony title in 1952, were presented crowns made of seashells. They lasted a bit longer, but didn't survive the championship year. The Big Four received the first durable crowns at the Milwaukee convention in 1953. "They were rhinestones mounted on cloth material, and they were quite beautiful," reported Big Four replacement tenor, Mary Waters. The idea continued to evolve, spurred on by an enthusiastic membership and perpetuated by the chapters hostessing international convention (in 1953, the hostess duties were shared by the Milwaukee #1, Milwaukee Harmony and Wauwatosa Chapters). In 1954, the Mississippi Misses received pearl crowns, handmade by one of the members of the Kensington-Buffalo and Kenmore Chapters in New York. Unfortunately, not many of the first crowns have survived. Most disintegrated before the completion of the quartets' championship year. However, in 1955, Nota-Belles were presented rhinestone tiaras by the hostess chorus in Grand Rapids, MI. They also received roses, fur-trimmed capes and scepters. Not only did these crowns make it through their championship year, they set a precedent for future gifts to the champions. The capes and scepters continued until the mid-1960s. Over the years the crowns continued to become as individual as the quartets wearing them. Some were full circles and some were tiaras. Some were silver and rhinestones presented on beautiful hand-made, white satin pillows. Some had pearls or colorful jewels and gems inserted in sparkling designs and swirls. "The Sea Adelines won in Toronto in 1962." reported Zoe Thompson, bass, "It was the first time our convention was in a city outside of the US. Because it was Canada, the handmade crowns featured a gold maple leaf in the center. They were beautiful!" According to Renee Craig, lead of the 1957 champions, The Cracker Jills, "The Miami Chapter presented us with crowns hand-made with string pearls and colorful gems. In addition we received long capes which had a collar and beads with the same type of gems as were on the crown." In 1979, the Tetrachords, 1978 champions and members of the hostessing Kirkwood, MO Chapter (now St. Louis Harmony Chorus), asked to see the new crowns so they could practice putting them on the heads of the new champions. "The crowns were so tiny," said Nancee Reinhold (bass). "They looked like they were made for little girls." The quartet contacted members of the Coronet Club with their concerns, and without skipping a beat (or the curiosity of local businessmen and shoppers), a contingent of crown-wearing women made their way to a carnival supply store in St. Louis and promptly selected and purchased four "queen-sized" crowns. 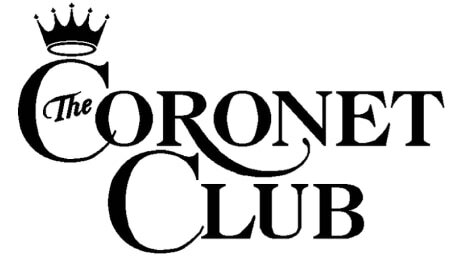 As a means of quality control, it was decided that the Coronet Club would assume responsibility for purchasing and providing crowns to future champions. The Hallmarks (1979) received these "more substantial" crowns. Most of the more recent crowns have been silver and rhinestones or crystal, however Weekend Edition received gold crowns to commemorate the 1995 celebration of the organization's 50th anniversary. Over the years the crowns have graced the cover of the Pitch Pipe and glistened in the stage lights, attracting attention by members and non-members of Sweet Adelines. Although the gold medal continues to serve as the prize for earning the most points at international competition, the ultimate gift to the champions is the crown, and it lives on as a lovely and lasting tradition of our organization -- the symbol for becoming the World's Champion Women's Barbershop Quartet. The Junior Misses, 1956. Some were 16 and some 17. The Growing Girls, 1989, were at least 21 when they won. Bertha Bradley (Bass) and Inez Junior Thompson (Lead), 1953 Big Four. Florence Anderson (Tenor) and Joyce Cunningham (Lead), 1958 Sweet And Lows. Vicki Gibson (Bass), 1975 Front Office Four and Kendra Lapointe (Tenor), 2006 Spotlight. Lynda Mears Keever (Lead) and Heather Mears Brooks (Baritone), 2008 Four Bettys. Virginia Clausen (Tenor) and Phyllis Odders (Lead), 1951 Quarternotes. Sue Arabian (Tenor) and Alice Kennedy (Baritone), 1959 Yankee Misses. Lorene Eller Roberts (Lead) and Diane Pauley (Baritone), 1961 Lyrics. Jean Shook (Lead) and Margaret Layer (Tenor), 1968 Galatones, . Connie Garcia Milestone (Lead) and Chris Huebschen (Baritone), 1970 Rarities. Lee Balaguer Davison (Lead), Jackie McConkey Bellshaw (Baritone) and Sally Otis Whitledge (Bass), 1972 4th Edition. Shirleyann Quigg (Lead) and Betty Tracy Clipman (Bass), 1980 Penna-Fores. Donna Bates (Tenor) and Maureen Brzinski (Lead), 1983 Melo-Edge. Bonnie Fedyski (Bass) and Amy Brinkman (Tenor), 1995 Chicago Fire.